The families here have to choose between selling their rice to cover expenses, or eating it to quell their hunger. Lately, they’ve been choosing the former to cover their main expense: the children’s $45 annual school tuition. The parents here know that education is the key to their children escaping poverty and leading better lives. But with the economic state the rice farmers are caught in, many can’t afford to pay the tuition at all. The school’s already in bad shape. In fact, it’s not even a school. It’s a one-room church with blackboards precariously leaning against the walls, where students sit in pews and take notes in their lap. More children are taught outside under a tarp, where the heat is so stifling it’s hard to breathe. Because the conditions here can’t be sustained with the lack of tuition payments, things will only get worse. Something needs to be done. After hearing about the urgent need for help in l’Artibonite, a retired builder from Colorado named Tim Myers volunteered to spearhead the construction of a new school for this community. Joining him is Fred Ireland, a doctorate in Exercise Physiology from Philadelphia. These two men have partnered with BRUTE LABS, a nonprofit based out of California committed to tackling global challenged using design and technology. The goal is to raise $110,000 to build a new school for these families being forced to choose between education and eating. You can help too, by donating to the cause and spreading the word. Visit our site to make a donation. 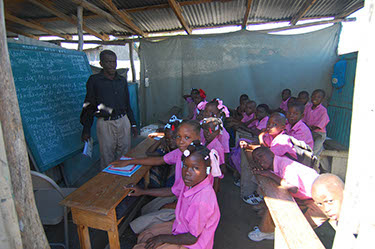 Follow @HaitiSchoolProj on Twitter, and like Haiti School Project Facebook. Together, we can build a school in Haiti.